Years ago I did a Buying Facilitation® program for a now-defunct group at KPMG. Before working with this team, they were using 2-4 people, spending between $500,000 and $1,000,000, and spending weeks creating large, glorious presentations to woo and wow the prospects as part of their proposal responses. They won 20% of the business. That means, they wasted 80% of their time (and either had to hire more people to make up the slack, or not have enough consultants to deliver and close real business). Using the sales model they can’t know, as it assumes that if gather the right data and ‘understand’ the problem, you can give great data and service to whomever shows up as a prospect and win the business. But that is obviously false: the sales model fails 95% of the time in conventional selling, 99% (using real numbers) of the time when using marketing automation, or 80% of the time when there are only a few vendors receiving the RFP and 90% with lesser-known companies. DAVE: Why aren’t you using AA for this job? Obviously, this was not going to be KPMG’s business. So instead of writing a proposal, we carefully went over the RFP and discovered all of the unresolved assumptions that weren’t being addressed as part of the RFP, recognized the change management issues they would have with the implementation, and higlighted the buy-in issues many of the departments were going to experience as they faced massive change and disruption once the project was underway. The project was en route to a disaster. How will you know when you have the adequate amount of, and appropriate buy-in before you begin, to diminish any disruption as you move toward implementation? What would you need to do, prior to choosing a vendor, to know if one vendor over another can build an implementation to avoid disruption entirely? When we saw your questions, we realized we had not considered the implications of bringing in this type of change. When AA was not addressing these issues we realized we would potentially have a disaster on our hands as many of our folks weren’t buying-in and we had not properly managed the change. We would like you to take over, and start with the change management issues before you move ahead with the work. 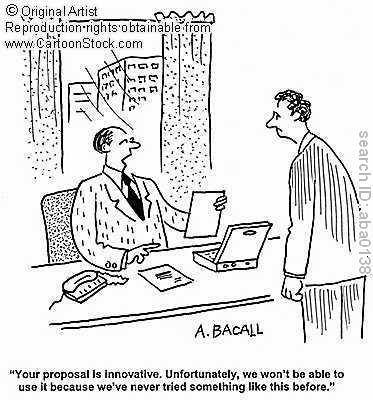 Sales folks assume that buyers merely need info and a relevancy statement about a solution in the RFP. But the tables are actually reversed: the companies use the proposals they receive to more fully understand the type of buy-in and change management actions they’ll need to handle as they decide their next steps. But it’s possible to use Facilitative Questions to help them discover all of the information they need. Instead of responding merely at the solution level, make sure your RFPs address the change implementation problems your solution will incur. Who knows: you might not even need that proposal – especially if you use Buying Facilitation® before you get the RFP, they have defined the people and steps necessary in their Pre-Sales decision and change journey and they know how to choose you over the competition. Because if a buyer knows exactly how to choose one vendor over another, or one vendor has helped them (before choosing a solution) through their steps to buy-in and congruent change, AND has the solution they need, they would not need an RFP. Thanks for the post! A great reminder about the importance of asking questions and approaching RFPs and proposal-writing in ways that move beyond the bureaucratic. I’ll now get back to the one I’m working on.